Everyone always has a variety of questions, especially when making the important decision about domiciliary care. We wish you to be fully confident that you are making the right choice in having Acquire Care supply your care or the care for a family member. Please contact us to ask any questions you may have. If you have not yet spoken to us about the free non-obligation meeting which will be arranged in your own home at a time convenient to you and your family, then please contact us on 01865 601010 or email info@acquirecare.co.uk. Q. What makes Acquire Care different from other care companies? A. Acquire Care exists to bring high quality, helpful and friendly domiciliary care services to enable Clients to enjoy living in their own homes. It is an independent company and is not part of a franchise. All the care packages are tailored to the Client’s needs with the aim to enhance independence. These care packages can be altered if and when needed. At all times, Acquire Care believes that the Clients should be listened to and that their rights are paramount. A. Acquire Care supplies hourly care throughout Oxford City and the surrounding areas. In addition, live-in care can be arranged further afield. Please contact us on 01865 601010 to discover if we can help you. Q. What is the difference between Home Care and Live-in Care? A. We provide both types of care services. Home Care is a tailor made package of visits to your home where everyday care and personal care tasks can be completed. The visits can be from a short visit or to up to as many hours as required. Live-in Care again follows a tailor made plan to fit in with existing preferences but the Carer lives in the house with the person they are looking after. Q. What must be supplied for a Live-in Carer? A. A private bedroom with linen must be provided as the Carer will be “living-in”. Access to a bathroom and toilet facilities are also essential. The resources for their meals must also be provided. Q. Do you recruit your Carers yourselves? A. Yes, each Carer has to be interviewed and vetted by us. They have to supply references and undergo Independent Safeguarding Authority (ISA) and Disclosure Barring Services checks as insisted by the Care Quality Commission. Q. Do you train the Carers yourself? A. Each of our Carers has to be trained by ourselves so that we are sure of their ability to look after our Clients. We have a dedicated in-house training office at Shotover Kilns where our in-house trainer ensures that all of our Carers are fully trained to a high standard. Through out their career with us, our Carers can improve their knowledge and skill by taking different courses. Q. How do I know if the person who comes is from Acquire Care? A. 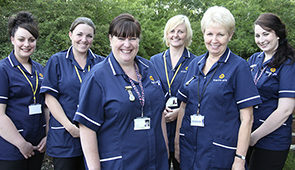 All our Carers will carry an Acquire Care identification badge and will wear an Acquire Care uniform. Q. What length of care is possible? A. Home Care packages can be as short as 1/2 hour or more than several hours depending on what care is being given. Live-in Carers are living in your home and will provide care throughout the majority of the day and evening. They will need to have an official break during the day but this will be discussed when the care package is decided. If it is necessary, another Carer can take over from the Carer having their official break. Q. What house-keeping duties are the Carers happy to do? A. Our Carers are happy to do most light house-keeping duties, for example dusting, vacuuming, empty bins, laundry. There must not be any heavy lifting involved though. However, if you require any house-keeping duties done, these must be noted on the Care Agreement. Q. Will my Carer look after my pets? A. Yes, it is realised how much pets mean to their owners. Therefore, as long as we know how many pets you have and what type they are, your pets will be looked after. We must know what pets are around your home as some Carers are allergic to some animals or birds. Q. I want to enjoy my life. Will my Carer support me to do this? A. It is essential that you continue enjoying your life for as long as possible. Whether you like to go out and/or having friends or family to visit you, your Carer will help you as much as possible. Q. Are you regulated by the Care Quality Commission? A. We are regulated by the CQC and inspected on a regular basis. Our last report can be seen on the website.